Faucet adapter to a Slip Hub. 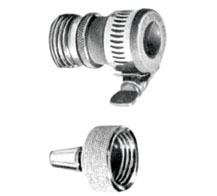 This adapter will convert a conventional threaded faucet to accept rubber plastic tubing for flushing and washing. Convenient for sink to table use. Chrome.